On Monday 28 September 2015, Center for Health Human Rights and Development(CEHURD) through the Coalition to Stop Maternal Mortality due to Unsafe Arbotion, marked the Global Day of Action on Safe and Legal Abortion. The global trending hash tag on social media was#BustTheMyth that all messages on myths and facts on abortion were attached to while sending out to followers on social media. A petition was read in line with the theme; Because every woman and Girl Counts and a campaign to have 1million signatures was launched. The campaign seeeks to have one million signatures which will be presented to parliament and the Speaker of Uganda Rt.Hon.Rebecca Kadaga and entire legislative council, to consider having a proper and clear law on abortion. Dr.Kiggundu and Dr.Collins were the campaign ambassadors. Two social media campaigns in line with the theme, were launched to boost the main campaign with the hash tags; #BustTheMyth and #LetHerSpeak: Because every woman and girl counts. Everyone concerned and believes that maternal health should be given priority in our country and world at large, is encouraged to sign the petition which is also available online. The hash tag #LetHerSpeak, will be trending for the next three months, with the major aim of educating people about the myths and facts on abortion and a video documented with true life stories about the same is available online along with the messages. 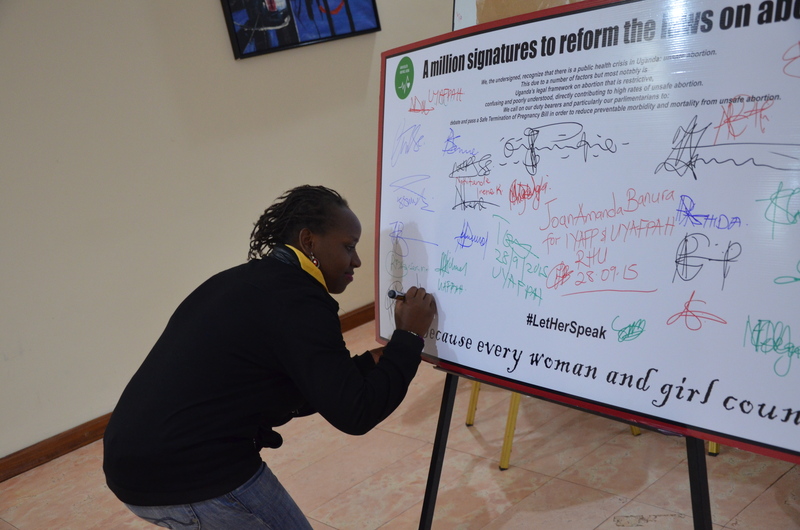 The launch of the One Million signatures campaign attracted over 55 guests,at Imperial Royale hotel who were mainly youth, health workers, bloggers,journalists and women with experience on abortion. Please join us in this campaign for every woman and girl counts! Tweet a myth or fact on abortion that Ugandans need to know about with the hash tag #LetHerSpeak. The petition cheque to sign on is available at CEHURD for your signature.